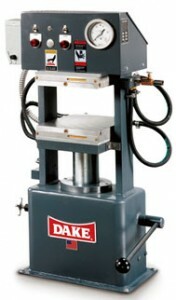 Dake offers hand, air, and electrically operated H-frame presses in 10 to 200 ton capacities, in single- and double-acting models. These presses are ideal for assembly, straightening, fabrication, quality control, maintenance, product testing, bending, forming, punching and shearing. Press frames are constructed of heavy-duty arc-welded steel and can be easily modified to accommodate a wide range of pressing needs. Steel cylinders are fabricated of heavy-walled tubing, which is seamless to prevent leaks and is roller burnished on the ID to ensure long packing life. For compression molding, laminating, testing and more.25, 50 and 75 ton models. Hydraulic system: A unique pump design provides a rapid advance of the ram utilizing the high volume-low pressure portion of the pump. When the down stroke of the pump lever is used, the pump automatically converts to the high pressure-low volume output providing accurate control and easy operation. 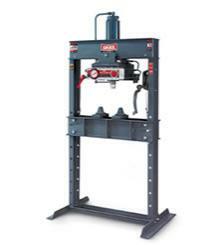 The carefully – constructed hydraulic system enables the press to hold pressure for extra long periods of time. The release valve on the side of the press enables the operator to adjust the pressure accurately as well as accomplish gradual decompression or fast opening of the press.